The Central Commission for Discipline Inspection (CCDI) — China’s top anti-corruption agency and the highest internal-control institution of the CCP — released the announcement on its website. 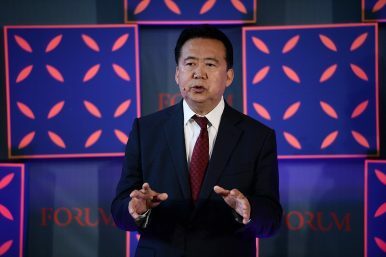 As The Diplomat reported earlier, Meng’s dramatic disappearance from the Lyon-based Interpol grabbed headlines in worldwide media for weeks. Last October, Meng’s wife, Grace Meng, told the press that she hadn’t heard from her husband since he was on a trip back to China in late September. Then Interpol claimed that the organization was aware of Meng’s “alleged disappearance” and that it had made a formal request to China for information about Meng. Other than this simple statement, no details about Meng’s whereabouts or the case against him were released by Chinese authorities. Ahead of Xi’s visit to France this week, Grace Meng told the French press that she had not heard from her husband since he was quietly detained last year. She also said that she had written to French President Emmanuel Macron to ask for his help. “I hope the president can help Mr. Meng and his family, to protect our fundamental human rights,” Grace Meng told the French reporters. Fearing for her own as well as her children’s lives, Grace Meng has applied for asylum in France and is under protection by the French police. Although it’s unclear whether Macron mentioned Meng’s case to Xi during their meeting, the timing of CCDI’s latest announcement looked like an implicit national reply. The announcement said that Meng had “completely lost his Party consciousness and sense of organizational rules.” Meng’s misconduct includes “failing to report relevant personal information to the Party, refusing to implement decisions of the CCP Central Committee, using his power for personal purposes capriciously, lavishing public funds for his family’s extravagant life, taking advantage of his influence to secure a job for his wife and to seek private benefits, and accepting huge amounts of money and gifts from others,” according to the announcement. Under suspicion of bribery, Meng has been transferred to the procuratorate for further investigation and prosecution, while his illicit gains will be confiscated, the announcement added. Notably, it was at the 18th CCP National Congress in 2012 that Xi replaced Hu Jintao as general secretary of the CCP. So what the CCDI’s announcement was really trying to say was that Meng’s crime was misbehaving “even after” Xi took office.